Foldable Swimming Ladder for Inflatable Boats, Dinghy, KaBoat. 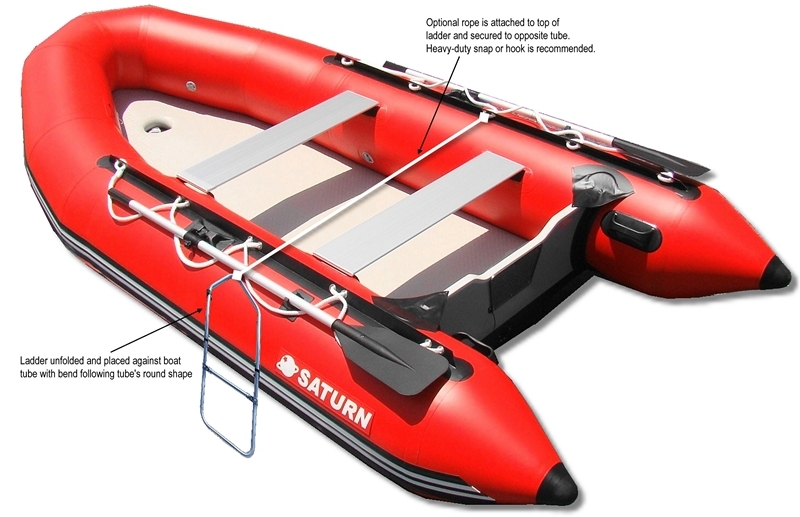 Folding Swimming Ladder for Inflatable Boats, KaBoats and Rafts. Lightweight, folding aluminium ladder designed to make it easier to get back aboard of inflatable boat, dinghy, raft, KaBoat or kayak after swimming in water. Made of heavy-duty aircraft grade aluminium. This ladder is a must for anyone who wishes to go swimming from an inflatable boat, and then be able to easily get back into the boat. The ladder folds down to portable size of 14 x 17 x 3" and can be easily stored anywhere inside even smallest of inflatable boats or KaBoats. Its weight merely 36oz and can support weight of up to 200 lbs. Video showing use of swimming ladder attached to inflatable boat.